The Elan Art Gallery is located on the first floor below the Elan Guest Suites. The Elan's currently featured artist is Gabriel Mark. Gabriel's frozen moments in time communicate the ineffable. Saturated in beauty, the mundane is transformed into the fantastic. His subjects are of the people and architecture he encounters on his travels. 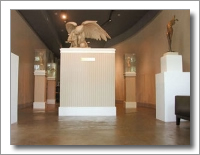 Other fine art galleries within the region include Southern Oregon University's Schneider Museum Of Art, Davis and Cline and Hanson Howard Gallery. Plan your visit to Jacksonville.